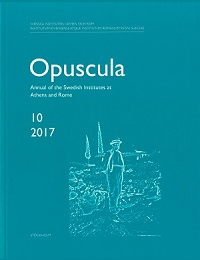 All contributions to Opuscula and the Institute’s book series are peer reviewed. The peer review process is described below together with a guideline for submitting manuscripts. We ask all our contributors to closely follow the Guide for Contributors to expedite the peer review process as well as the publication process. Submitted manuscripts are reviewed in three steps. A member of the Editorial Committee reads the manuscript to ensure that all minimum criteria are met and that it follows the guidelines for submissions. The manuscript is thereafter sent to a member of the International Advisory Board, who recommends two or more external reviewers. The external reviewers submit their evaluations to the Editorial Committee. Based on the comments and recommendations by the reviewers, the Committee accepts, accepts after minor or major modifications, or rejects the manuscript for publication. The Editorial Committee employs a double blind process (to the extent that this is possible), i.e. both author and reviewer remain anonymous to the other party. All authors are encouraged to make every effort to uphold the anonymity in the text. When an article or a monograph has been accepted for publication, the author will be provided with the review report(s) and asked to submit a revised version of the manuscript. A title page with the title of the manuscript as well as the name of author(s) (if more than one author, the corresponding author should be indicated), preferably academic affiliation, and full address details with e-mail address. The date on which the manuscript was finished may be given here. An abstract of 150 to 200 words in English. One Word file with the main text, including footnotes, bibliography and lists of tables and figures. A document (.doc, .pdf, .ppt) with good quality copies of all tables and figures, numbered and set in roughly the intended size for publication. Separate high resolution picture files should not be sent at this time. A cover letter indicating the author’s response to the review comments, and the changes made in the manuscript. A title page (see B above). Illustrations. At this time, the author should submit high-quality TIFF files, following the guidelines for illustrations given below (E). The illustrations should be numbered consecutively as 01, 02, 03 etc. Tables should be submitted in Excel or Word format and be clearly numbered. Manuscripts may be written in English, French, German or Italian. The following rules have been formulated for manuscripts in English, but should also be followed as far as possible for manuscripts in the other languages. All pages should be numbered consecutively throughout the text. Footnotes should be numbered in one series and formatted according to the style of reference given below (F). The first footnote containing acknowledgements, special abbreviations, etc., should be referenced by an asterisk at the end of the abstract. Cross-references using page numbers should be avoided. Tables must be numbered in one series as Tables, all other illustrations in another series as Figures (not Plates, since they will normally appear in the text and not on separate plates). References to illustrations and tables should be called out consecutively in the text (e.g. Fig. 1 is called out before Fig. 2, etc., Fig. 2a is called out before Fig. 2b, etc. ), normally within parentheses, thus: (Fig. 3) or (Table 1), capitalized and italicized. Greek text should be set with one standard Greek Unicode font, e.g. the New Athena Unicode font for Greek (free to download from http://apagreekkeys.org/NAUdownload.html). Inscriptions should be bracketed according to the “Leiden system”, as used in standard epigraphical publications. A complete copy of the final manuscript should be retained by the author. A manuscript which does not comply with these rules may be returned to the author for revision. As a rule, the author will be sent only the galley proofs for correction. Only printer’s errors should be corrected and no textual changes or additions made. Any such changes may render the author liable for the incurred costs. The author of a manuscript published in Opuscula or in another multi-authored volume, will receive one copy of the printed volume free of charge, and a PDF of the article that he/she can publish in an open repository. The author(s) of a monograph will receive 20 copies of the book free of charge. The editor(s) of a multi-authored volume will receive 10 copies of the book free of charge. The following guidelines apply for the revised submission. Illustrations, i.e. line drawings, photographs, maps, charts and diagrams, should be submitted in digital form. Digital images must be scanned in 300 ppi (greyscale or colour) or 600 ppi (bitmap) and be submitted in TIFF format, in the size they are to be published. JPEGs are not recommended. The TIFF files should be labelled 01, 02, 03 etc. The size of the illustrations should follow the type area; for Opuscula and 4° volumes: 80 × 220 mm (one-column width) or 170 × 220 mm (page width); for 8° volumes: 130 × 190 mm. There must be a complete list of figures and tables. The scales of drawings, as well as the scales and the orientation of maps and plans must be indicated (normally North should be upwards). Illustrations must be prepared in such a way that no retouching whatsoever is needed. In cases in which the layout of the illustrations is complicated, the author should contact the editor before completing the manuscript. It is the author’s responsibility to obtain permission to reproduce any material protected by copyright. The author must sign and submit the Author’s Warranty and Copyright Assignment Form before the manuscript is published. Abbreviations for ancient authors and works should follow the list given in The Oxford Classical Dictionary, eds. S. Hornblower A. Spawforth, or online. The abbreviations used by Liddell, Scott Jones, A Greek-English lexicon, Oxford, or by L’année philologique should be avoided because of their brevity. Themistius Orat. 3.4 (p. 31.15 ed. W. Dindorf, Leipzig 1832). IG II2, 15, line 87.1. Bibliographical citations are to be given only in footnotes. Brief citations of ancient authors may, however, be put in the text. Citations will refer to the bibliography at the end of the manuscript. References in notes should consist of the last name of the author(s)/editor(s), the year of publication, and relevant inclusive pages, sections, figures, plates, etc. If there are more than two authors or editors, the first author’s name should be given followed by et al. When there are two or more works by the same author from one and the same year, these works will be distinguished by the letters a, b, c, etc. after the year. When there is more than one author with the same last name, an initial should be added to the author abbreviation. Åström 1998a, 5, fig. 2; S. Marinatos 1940–1941, 132. Always cite the first and last page referred to, thus: 76–81, not 76ff. When only two pages are referred to, 76f. is acceptable for 76–77. All numbers for pages and columns should be written in their entirety, thus: 120–134, not 120–34. The abbreviations n., nn. (= notes), fig., figs., pl., pls., no., nos. should be used. When referring to figure and table numbers within your own article, please capitalize and italicize: Fig. 3, Figs. 4–5, Table 2. References within a footnote should be separated by a semicolon. Expressions such as op. cit., loc. cit. and ibid. are allowed only within a footnote; they should not be italicized. Use p., pp., col., cols. only when necessary for clarity. The author-and-year abbreviations are not obligatory in the case of excavation reports and standard reference works of different kinds, for which special abbreviations are in general use, see the list of American Journal of Archaeology at www.ajaonline.org (under Author Guide/Bibliographical References and Notes). Agora V = Robinson, H. 1959. The Athenian Agora. Results of excavations conducted by the American School of Classical Studies at Athens V. Pottery of the Roman period: chronology, Princeton. Un artista etrusco = Un artista etrusco e il suo mondo. Il pittore di Micali (Studi di archeologia pubblicati dalla Soprintendenza per l’Etruria meridionale, 5), Roma 1988. CVA Karlsruhe 1, Taf. 1:1 (Deutschland 7, Taf. 299). LIMC VI (1992), 575 s.v. Minotauros, no. 6 (S. Woodford). Articles and books end with a bibliography in alphabetical order by last name of first author and in chronological order by year of publication under each author. Abbreviations of titles of well-known periodicals and standard reference works should be used, and should follow the list of www.ajaonline.org (under Author Guide/Bibliographical References and Notes). The full citation of a book or monograph should comprise the following: author’s last name and initial(s), co-authors (if any), year of publication, title of work including subtitle (both title and subtitle in italics), and (within brackets, not italics) name of the series or collection with volume number, and place of publication. The name of the series or collection is given only if the volumes are numbered. The number of the edition should be given in connection with the year of publication by means of a small, superscript number. Ahlberg, G. 1971. Prothesis and ekphora in Greek Geometric art (SIMA, 32), Göteborg. Cook, R.M. 19973. Greek painted pottery, London New York [placed alphabetically]. Wells, B. 1983. Asine II. Results of the excavations east of the Acropolis 1970–1974, Fasc. 4. The Protogeometric period, Part 2. An analysis of the settlement (ActaAth-4º, 24:4:2), Stockholm. The full citation of an edited volume (collection of articles, Festschrift, conference proceedings or the like) should comprise the following elements: editor’s/editors’ name(s) followed by “ed.” or “eds.”, year of publication, title of volume including subtitle (both title and subtitle in italics), name of series or collection (within brackets, not italics), and place of publication. Wallensten, J. M. Haysom, eds. 2011. Current approaches to religion in ancient Greece. Papers presented at a symposium at the Swedish Institute at Athens, 17–19 April 2008 (ActaAth-8º), Stockholm. The full citation of an article in a periodical should comprise the following elements: author’s last name and initial(s), year of publication, title of the article within single inverted commas, the full or abbreviated name of the journal (italics), the volume number, and first and last page numbers of the article. Long articles in encyclopaedias can be treated as articles. Pakkanen, P. 2011. ‘Is it possible to believe in a syncretistic god? A discussion on conceptual and contextual aspects of Hellenistic syncretism’, OpAthRom 4, 125–141. Demakopoulou, K., N. Divari-Valakou, P. Åström G. Walberg 1996. ‘Excavations in Midea 1994’, OpAth 21, 13–32. Karo, G. 1937. ‘Tiryns’, RE VI A:2 (1937), 1453–1467. The full citation of an article in a collection, which is not a periodical, but a Festschrift, a volume of miscellanea, conference proceedings or the like, should comprise the following elements: author’s last name and initial(s), year of publication, title of the article within single inverted commas, the word “in” followed by the title of the volume (italics), name of the series or collection (if applicable, within brackets, not italics), “ed.” or “eds.” followed by editor’s/editors’ name(s) with initial(s), place of publication, and page numbers of the article. Caskey, M.E. 1990. ‘Thoughts on Early Bronze Age hearths’, in Celebrations of death and divinity in the Bronze Age Argolid. 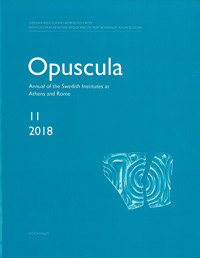 Proceedings of the Sixth International Symposium at the Swedish Institute at Athens (ActaAth-4º, 40), eds. R. Hägg G.C. Nordquist, Stockholm, 13–20. Voigtländer, W. 1973. ‘Zur Chronologie der spätmykenischen Burgen in Tiryns’, in Tiryns VI, Mainz, 241–266. When a volume of a periodical was published after the year for which it was published, the actual year of publication should be given within brackets preceded by the abbreviation pr. (= printed) or publ. (= published). Verdelis, N.M. 1963 (pr. 1965). ‘Neue geometrische Gräber in Tiryns’, AM 78, 1–62. When there are two or more works by the same author from one and the same year, these works will be distinguished by the letters a, b, c, etc. after the year. Åström, P. 1998a. ‘An altar to an unknown god at Hala Sultan Tekke’, JPR 11–12, 4–6. Åström, P. 1998b. ‘Alfred Westholm 1904–1996. Minnesteckning’, in Minnestal hållna på högtidsdagarna 1996–1998, Kungl. Vetenskaps-och Vitterhets-Samhället Göteborg, Göteborg, 39–42. (a) to cite the volumes of modern works (especially excavation reports, such as Corinth, Kerameikos, Tiryns) and the volumes of collections (such as IG, CIL, CAH, RE) in connection with which the use of Roman numerals has become established practice. Volume numbers should not be italicized. (b) to give references to works in which pages or plates are numbered with both Roman and Arabic numerals. In all other cases Arabic numerals are to be preferred. Titles of books and articles should not be capitalized. Only such words as are normally capitalized in ordinary text should be capitalized in a title, such as “Bronze Age”, “Hellenistic”, “Archaic”, “the Roman Empire” and so on. For citation of electronic sources, pages on the internet, CD-ROMs and similar electronic publications, see www.ajaonline.org (under Author Guide/Bibliographical References and Notes).